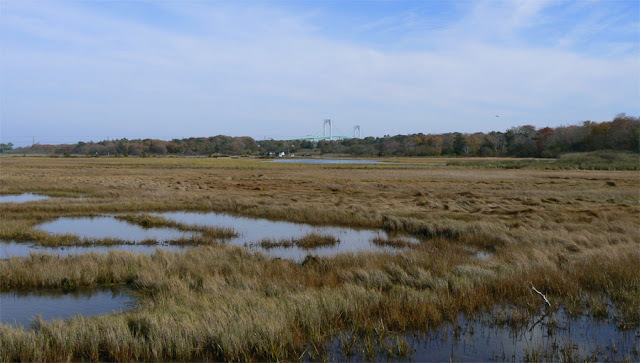 Tried a couple of short local outings today, hopeful that Hurricane Sandy may drift a waif or two to Gill and/or the surroundings. 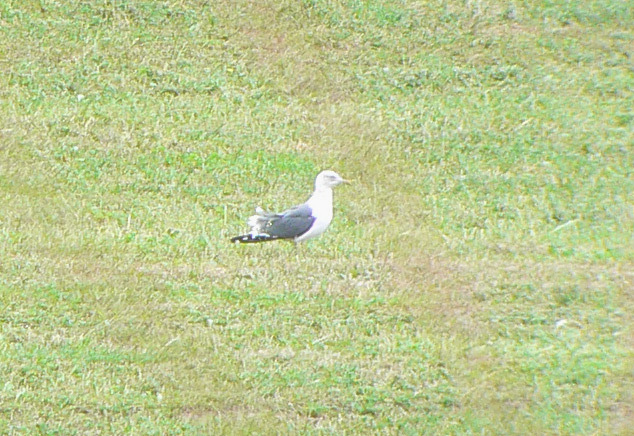 No obvious signs of anything particularly storm-driven, but the morning outing was especially productive with an adult Lesser Black-backed Gull in a huge field east of Main and Munn's Ferry Roads in Gill. 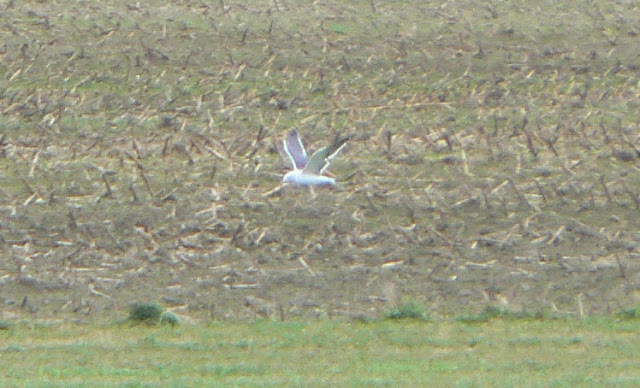 At the time it was the only large gull present along with a tiny handful of Ring-billed Gulls. A return visit in late afternoon produced half a dozen Herring Gulls, but no sign of the Lesser Black-backed. The same field also held up to 1000 Canada Geese, sorting through them being frustrated by distance and the many undulations within the field. 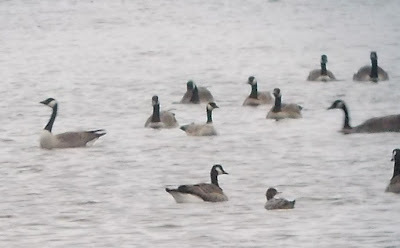 I didn't find anything other than Canada Geese there, but a late morning visit to the power canal produced a sharp, crisply marked Cackling Goose, perhaps yet another individual for this month or maybe just continuing bird first seen on October 10th. Distance, lighting and posture differences are making me increasingly wary of trying sort out individual birds, but I remain happy that we've had at least three individuals on the power canal this month. 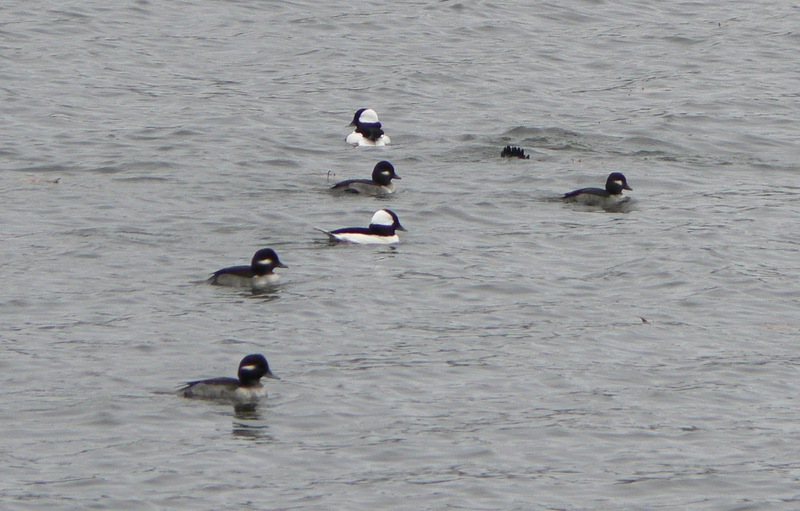 The power canal also held 13 Buffleheads and 2 Pied-billed Grebes. Closer to home, and for the third straight day, a flock of White-winged Crossbills passed over Main Road, Gill early in the morning, but I've yet to pin down where they might be feeding. 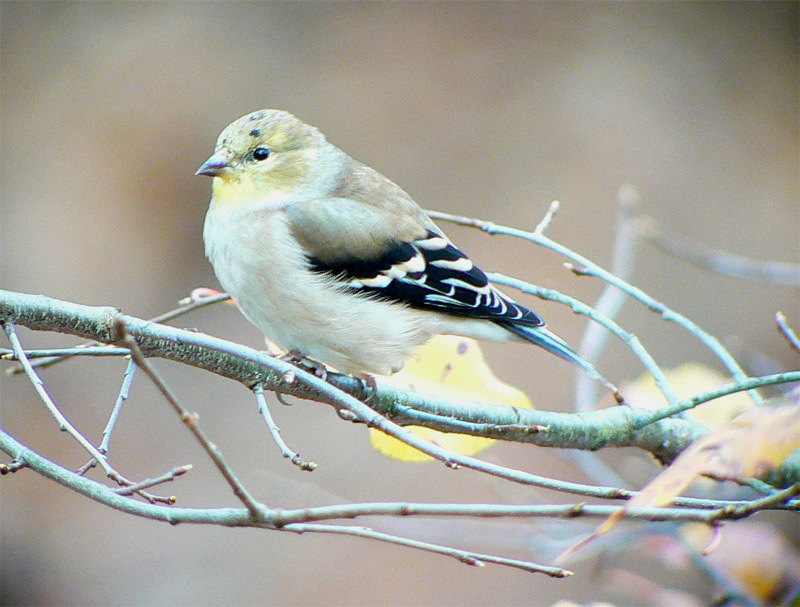 All day long, American Goldfinches and Pine Siskins hit the feeders. 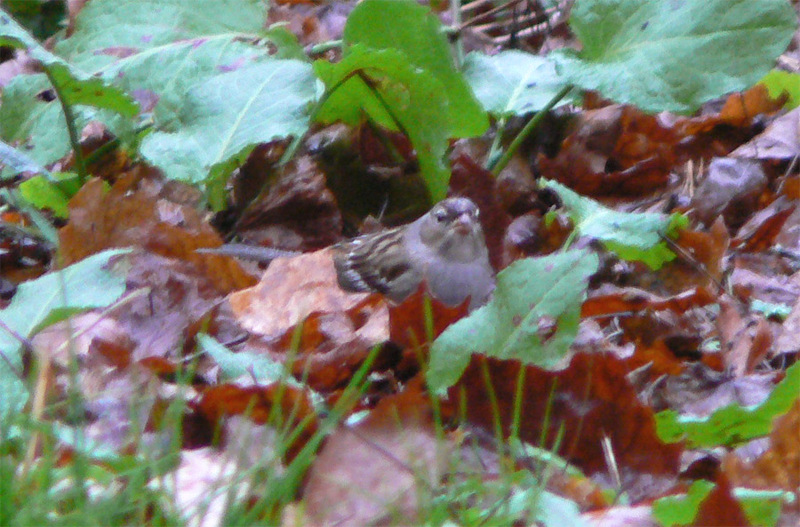 A dull, immature White-crowned Sparrow showed up with the White-throated Sparrows at the end of the day, our first in the yard this fall. So, regarding Hurricane Sandy, we'll see what tomorrow brings. Buffeheads - nice group of 13 individuals. My first of the fall, though Josh Rose had some at the same location whilst leading a Hampshire Bird Club trip on October 27th. Turner's Falls power canal, Franklin Co., MA. October 29th, 2012. Cackling Goose (B. h. hutchinsii) - On reflection, most likely the individual first found on October 10th: http://pioneerbirding.blogspot.com/2012/10/ma-cackling-goose.html. 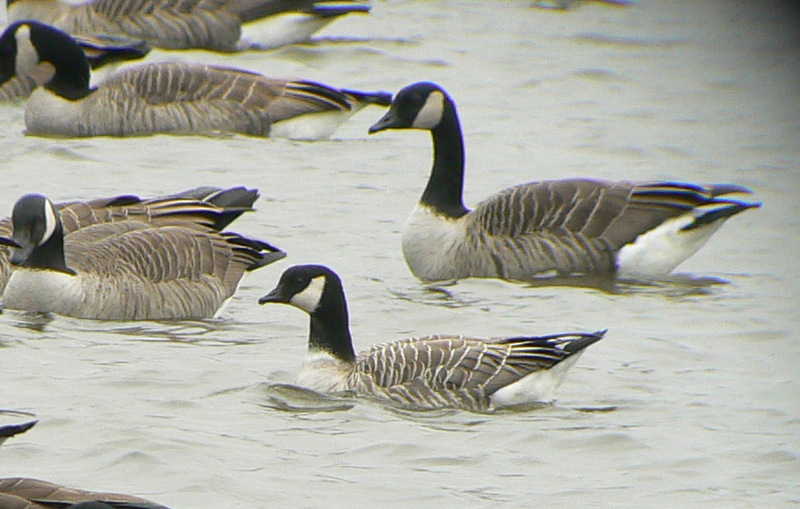 A smart, crisp, rather pale individual relatively easy to pick out from the surrounding Canada Geese. Turner's Falls power canal, Franklin Co., MA. October 29th, 2012. Lesser Black-backed Gull - adult/near adult, Munns Ferry Road, Gill, Franklin Co., MA. October 29th, 2012. This bird surprised me. 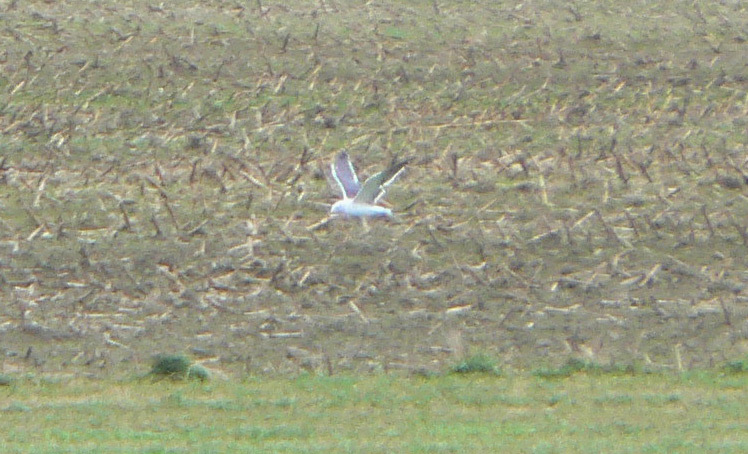 It was the only large gull present in this field with a mere half-dozen Ring-billed Gulls foraging in the same area. One of my earliest in the Pioneer Valley and my first in Gill away from Barton Cove. 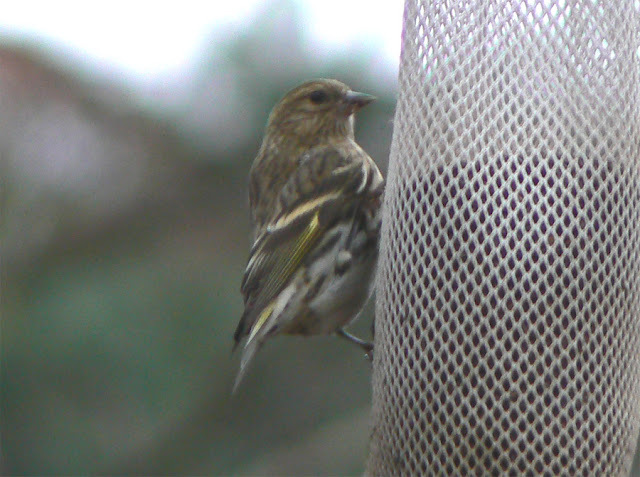 Pine Siskin - Gill yard, Franklin Co., MA. October 29th, 2012. White-crowned Sparrow - first-winter, Gill yard, Franklin Co., MA. A nice early evening surprise and our first of the fall. October 29th, 2012. 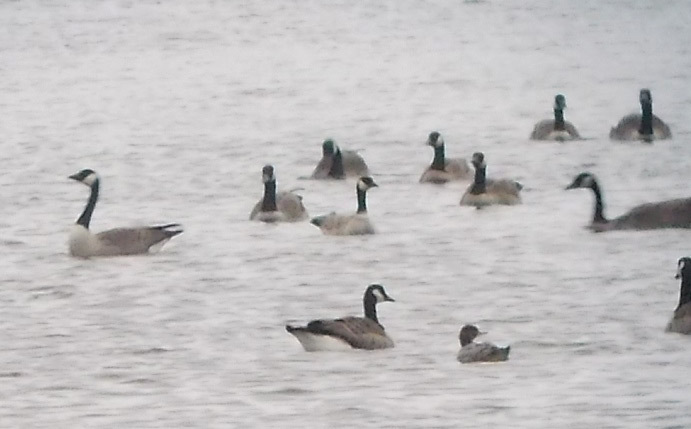 Alas, no Pink-foot but some 800 Canada present, split into three major groups making sorting through them quite tricky. A Pink-foot or a White-front could have easily been tucked into one of the more distant groups. 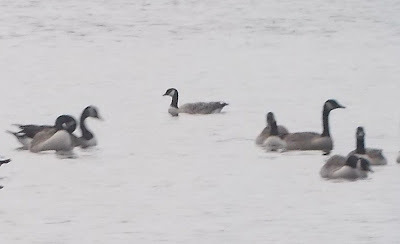 After sometime I located a Cackling Goose which looked like a new arrival and was subtly different to the bird I first located here on October 10th. 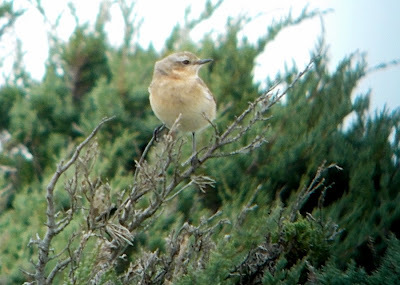 That individual, by the way, is still being seen and was still present on October 25th/26th. Currently, it seems to favor the bike path side of the power canal best accessed from Depot Street in Turner's Falls. Elsewhere on the 26th; 75 Pine Siskins in our yard in Gill, and an Evening Grosbeak flying over Barton Cove continuing the 'irruptive finches' theme. Winter Wrens at Turner's Falls power canal and close to our yard on Main Road, Gill. 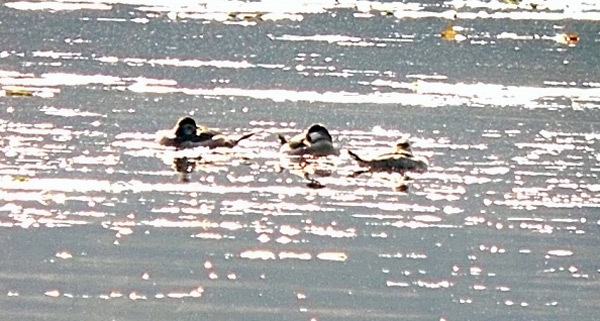 And finally, four Pied-billed Grebes and three Hooded Mergansers at Barton Cove but no signs of any scoters - observers at many inland lakes currently reporting quite large flocks of Black Scoters. 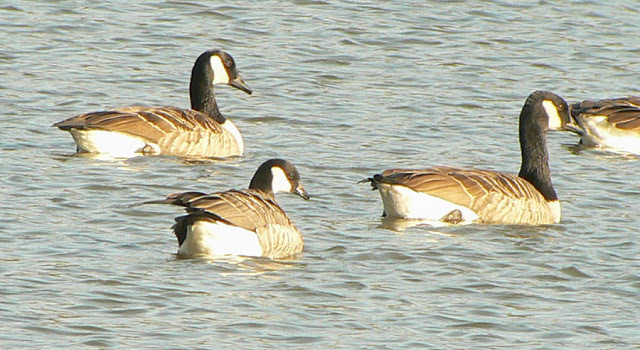 Cackling Goose (B.h. hutchinsii) - appears in the center of each of the above images. At least four individuals have now appeared at the power canal since October 10th. 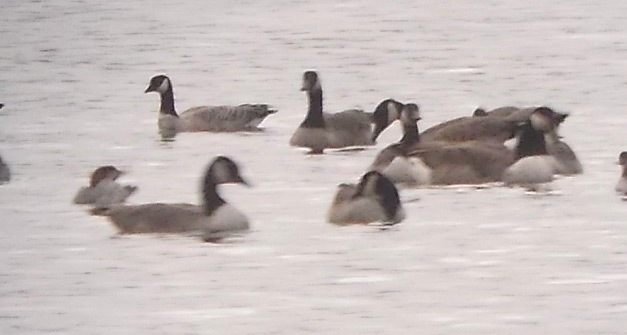 Seemingly incredible consistent this fall - almost every visit since that date producing a Cackling Goose. Turner's Falls power canal, Franklin Co., MA. October 26th, 2012. 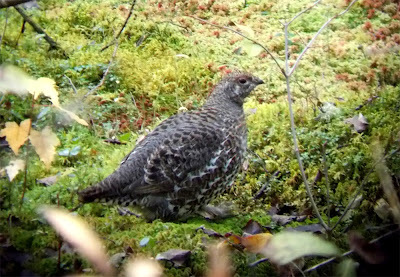 Images taken using a Panasonic Lumix FZ7 hand-held against a Swarovski HD scope. 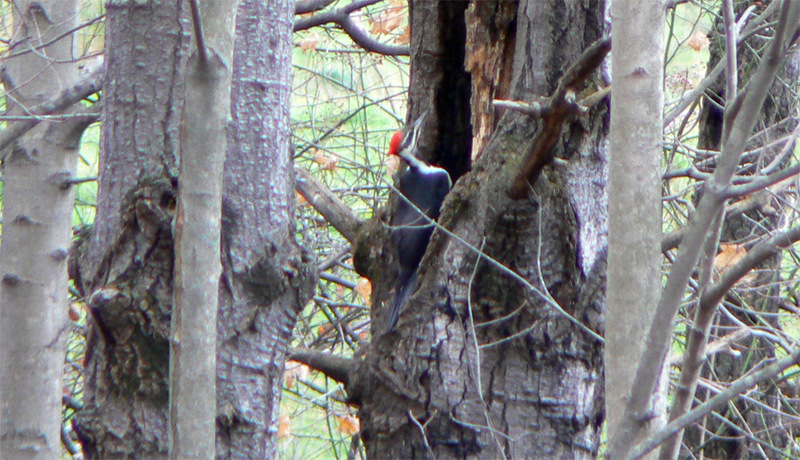 The last couple of days have seen some very cool birds in our yard in Gill. Yesterday (Oct 25th) I stepped out to look at a group of Pine Siskins (and including a nice male Purple Finch) that had come down to stream to drink and bathe. 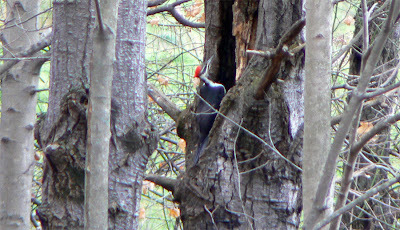 As I watched, I could hear the hollow thudding of an excavating Pileated Woodpecker and found the bird working a maple across the stream - Hairy, Downy and Red-bellied Woodpeckers were also in the yard at the same time. Also notable, some 10 Yellow-rumped Warblers foraging and fly-catching, and nice looks at a Ruby-crowned Kinglet in the willows. 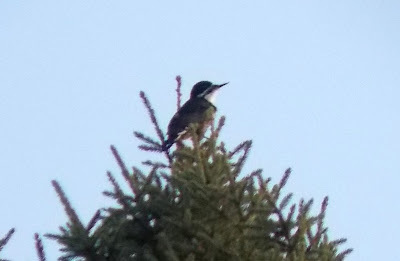 Towards dusk, huge numbers of American Robins (300+) departed from the meadow presumably heading off to roost, and a Hermit Thrush was foraging at the edge of the stream. Finally, having had the nyjer seed feeders up for almost a week, the first American Goldfinches appeared to use them in late afternoon. The last couple of days have seen more Barred Owl activity around Gill and, with increased reports cropping up on the New England listserves including urban and coastal locations, I can't help but wonder whether this species is also involved in the current 'wave' of irruptive species from further north. 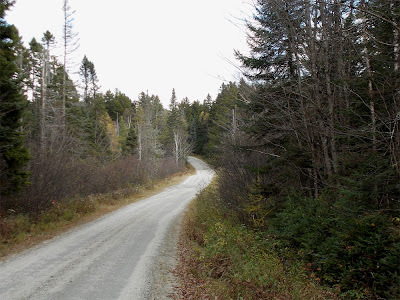 Yesterday (Oct 25th) evening, Susannah heard a Barred Owl calling close to our yard on Main Road at about 8 pm. Then, this morning (Oct 26th) on my pre-dawn dawn run, I heard three individual birds in the vicinity of North Cross Road, Gill. All three were giving an extremely loud, far carrying "whoooo" call, quite drawn out and descending, and rather different from the rhythmic, 'classic' 'who-cooks-for-you' call. Still on the theme of owls, on October 24th, I made my first outing of the fall for Northern Saw-whet Owls and met with success at the very first plot I tried on Mountain Road in Gill. The mixed forest with dense stands of young Eastern Hemlocks seems perfect for saw-whets. From here I tried a couple of commercial sound recordings and then switched to my own imitation of the 'classic' saw-whet tooting notes. After fifteen minutes I gave up and started to walk away from the plot. As soon as I reached the road, and with my back turned to the plot, a saw-whet gave three clear 'kew' calls in rapid succession; "kew, kew-kew". It's not the first time that I've been turned around by a saw-whet in this manner but it felt good to get such a positive response. I returned to the hemlocks once more and came away with exactly the same result - no visual and no audio! After five minutes, I walked away from the plot once more. Just a couple of minutes later, and with me standing comfortably on the road, the same saw-whet let out an explosive series of 'kew' notes, perhaps eight or nine in succession. I love these cunning little owls. Each and every observation is different and unpredictable, or at least that's usually the way it works out for me. Most 'contacts' are heard-only observations but every once in a while, a saw-whet will fly in silently, and just sit on a branch in full view making all the effort worthwhile. A most interesting day developing. This morning, around 7am, I had a calling White-winged Crossbill heading east over the top of Derby Hill in Gill. Minutes later, as I descended down the hill I had good looks at a Barred Owl crossing the snowmobile trail. 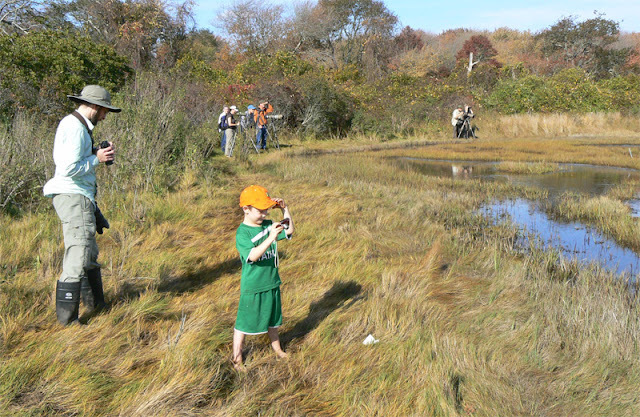 Susannah also had two Barred Owls calling on Main Road, Gill about 1 mile North-east of the intersection with Route 2. 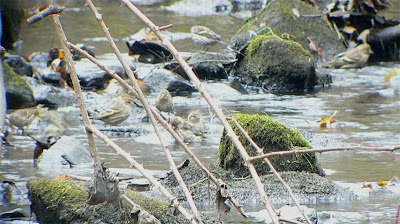 Winter Wrens (2) and Golden-crowned Kinglets again featured on our neighbor's property and our own yard was full of Dark-eyed Juncos bringing a Field Sparrow with them. 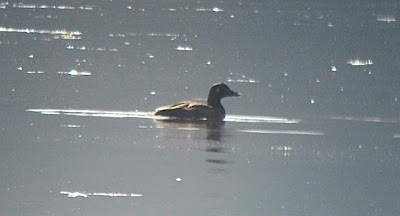 A quick mid-morning drive down to the Turner's Falls power canal was fruitless in terms of geese with only 4 Canadas present but careful scanning produced a few newly arrived waterfowl including a Pied-billed Grebe, 3 Ring-necked Ducks and a male Ruddy Duck. 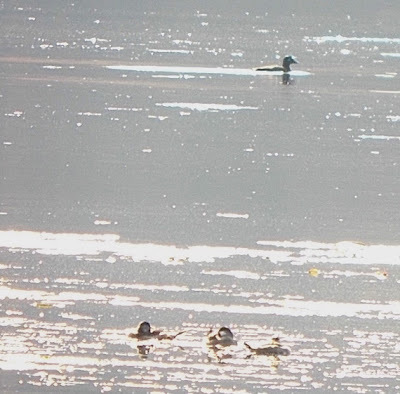 Similarly, Barton Cove looked very quiet at first but ultimately produced 2 Ruddy Ducks, 2 Hooded Mergansers and no less than 5 Pied-billed Grebes in what appeared to be a clear arrival of the latter species. Ring-necked Ducks - Turner's Falls power canal, Franklin Co., MA. October 24th, 2012. 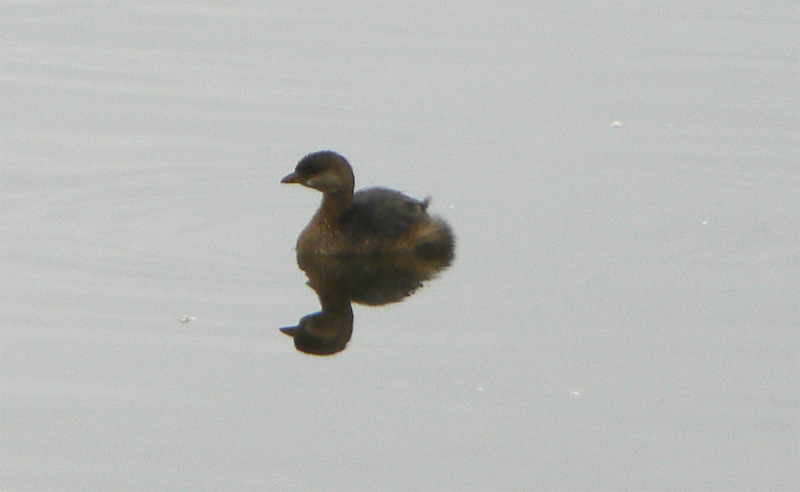 Pied-billed Grebe - Turner's Falls power canal, Franklin Co., MA. October 24th, 2012. 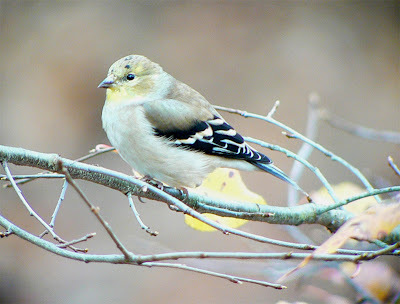 This morning's White-winged Crossbill may well fit within a broader pattern of irruptive northern passerines in New England and I've now seen reports of Pine Grosbeaks from Massachusetts and Vermont, Evening Grosbeaks, White-winged and Red Crossbills from Massachusetts, a Common Redpoll in Connecticut and an early Bohemian Waxwing in Vermont. 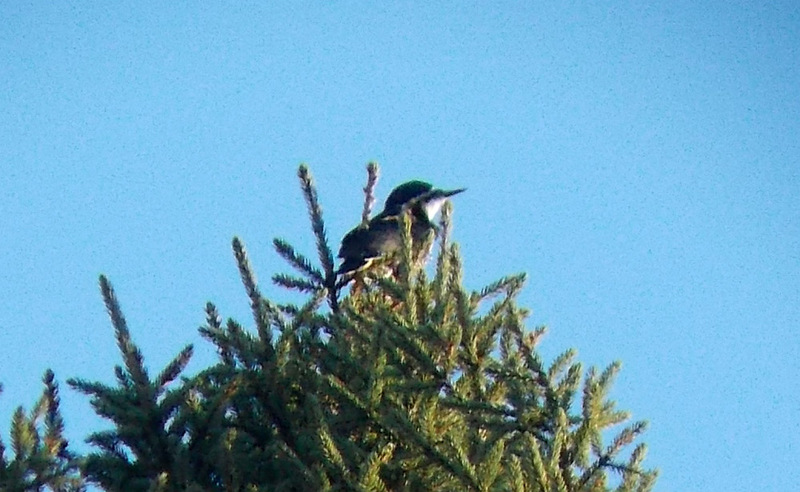 That's aside from the Pine Siskins and Purple Finches present everyday around Gill. This could be shaping up into a very interesting late fall/early winter. Ruddy Ducks (above) and Pied-billed Grebe (below) - Barton Cove, Franklin Co., MA. October 24th, 2012. 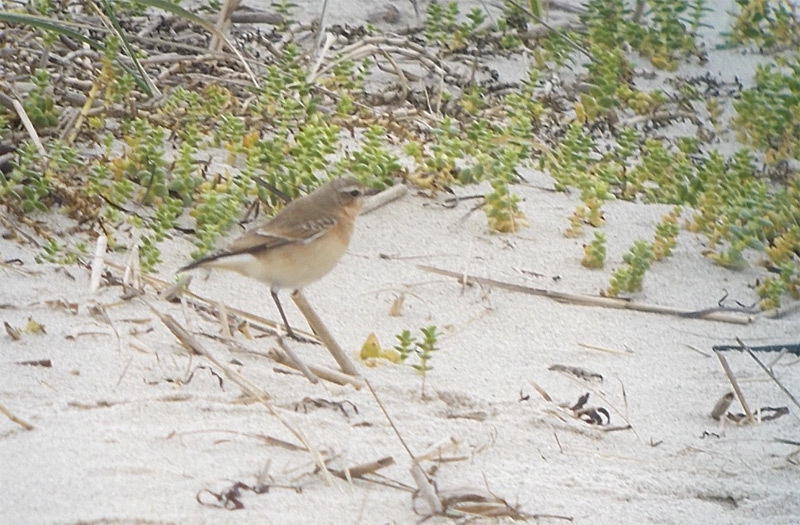 Northern Wheatear - Skaket Beach, Orleans, Barnstable Co., MA. October 14th, 2012. 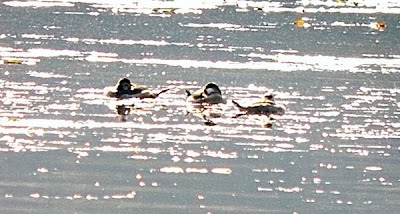 Digi-scoped shots taken using a Nikon Coolpix L26 hand-held against Swarovski HD scope. 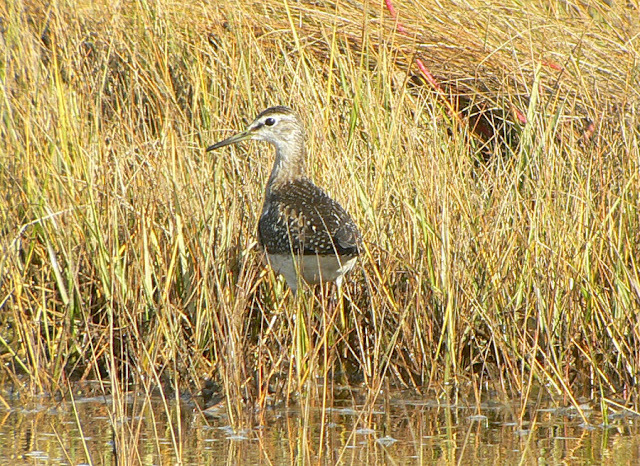 This long staying bird delighted many visitors to Skaket Beach after being found on October 10th by Bob Prescott and Diane Reynolds. We visited on a wild, squally day with strong westerly winds. 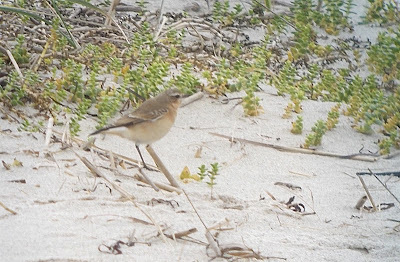 Somewhat elusive at first, it was hunkered down in the dunes behind the beach where most of the previous sightings had taken place. 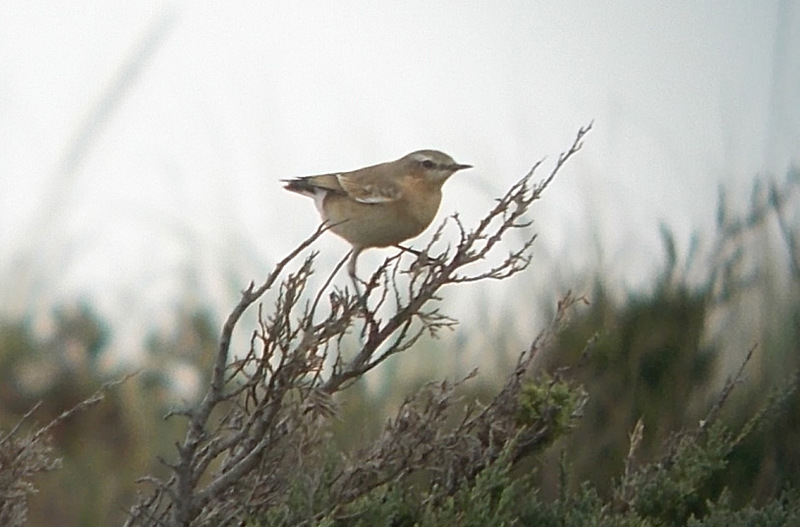 Though I see hundreds of wheatears every year in Israel, I had no problem in applying a little patience to wait for this bird to appear. During my morning run on Saturday (October 20th) I must have heard 6-10 American Woodcocks displaying above Boyle Street in Gill, all before 06:30am. I was little surprised to hear this much display activity, actually more remnaniscent of warm morning in late March than mid-October. Perhaps the balmy, foggy conditions stimulated the birds to display? 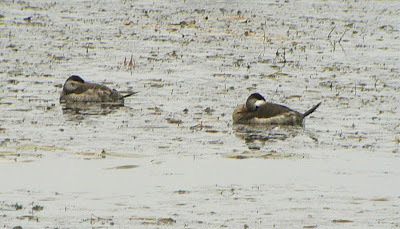 Again, around dawn, I disturbed two American Woodcocks from a field edge on our neighbors property in Gill this morning (October 22nd). The same property held many Golden-crowned Kinglets in what seemed to be a notable arrival, a couple of Winter Wrens and three 'Eastern' Palm Warblers. Wood Sandpiper - Marsh Meadows, Jamestown, Rhode Island. October 20th, 2012. 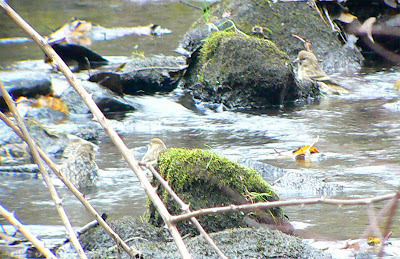 Digi-scoped image using Panasonic Lumix FZ7 hand-held against Swarovski HD scope. Exceptionally rare in the Lower 48 states with about seven records in all. 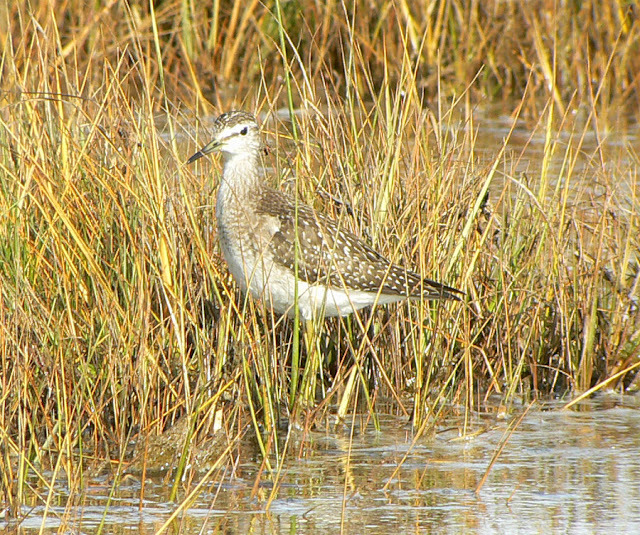 First found on October 13th by Carlos Pedro, a man accustomed to finding exceedingly rare birds in Rhode Island......nice work Carlos! This Wood Sandpiper was courteous enough to stick around for a week after its discovery and induce a 'family twitch', Saturday being the first day that we could all go together. 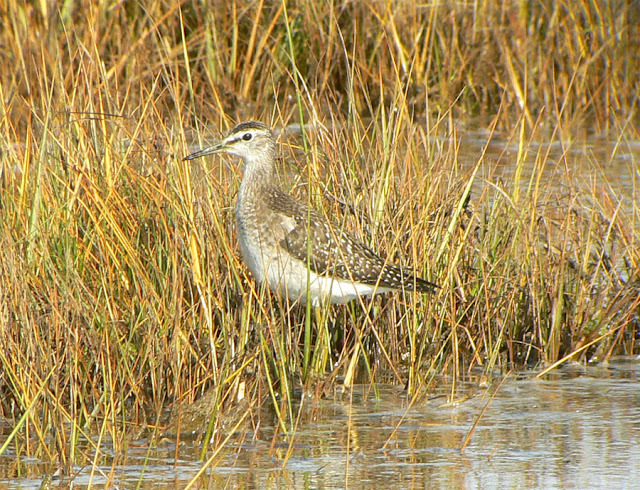 It was a life bird for Matan, an ABA bird for Susannah and my first in the Lower 48, but rather more attractive was the mystique of seeing a Eurasian shorebird on the East Coast of the United States. In North America, Wood Sandpiper is regular only in extreme Western Alaska so to have one show up within comfortable driving distance of our home in Western Massachusetts was a welcome surprise. 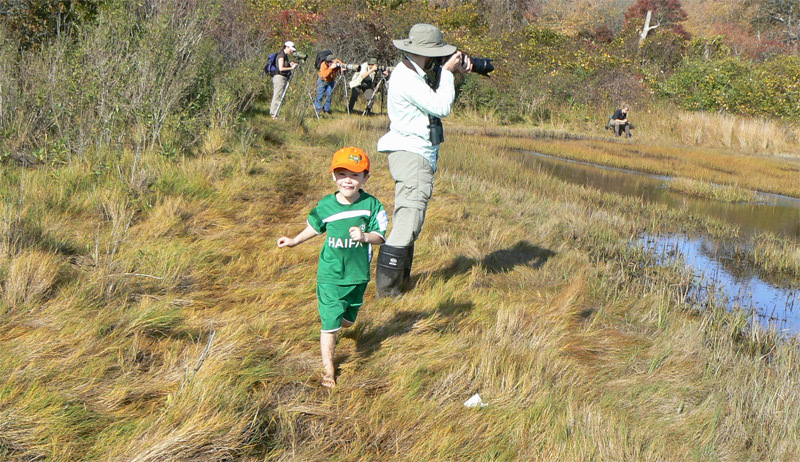 Moreover, it echoed other mid-October New England mega rarities which we chased as a family, namely the European Golden Plover in Maine, October 2008 and, remarkably, the Brown-chested Martin in Massachusetts in October 2009. 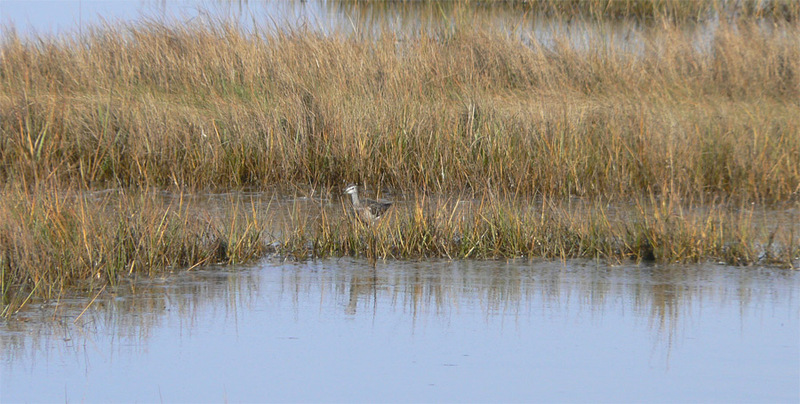 As if to emphasize the potential for extreme vagrants in New England at this time of year, Jeremiah Trimble found a Gray-tailed Tattler on Nantucket just two days earlier, scoring a remarkable first for Massachusetts and the East Coast of North America. 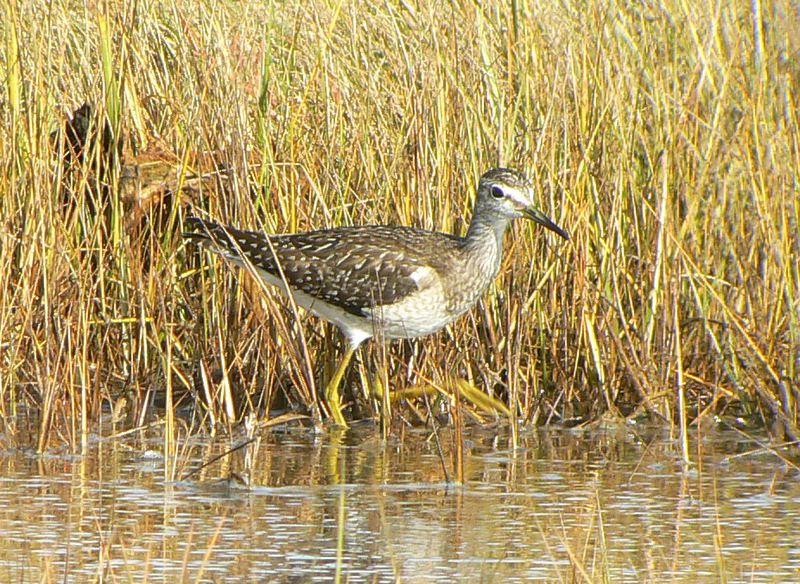 Had I not seen a smart Gray-tailed Tattler in Barrow, Alaska earlier this year I would have been very keen to join upwards of 60 birders on Nantucket who saw the tattler on the same day that we chased the Wood Sandpiper in Rhode Island. 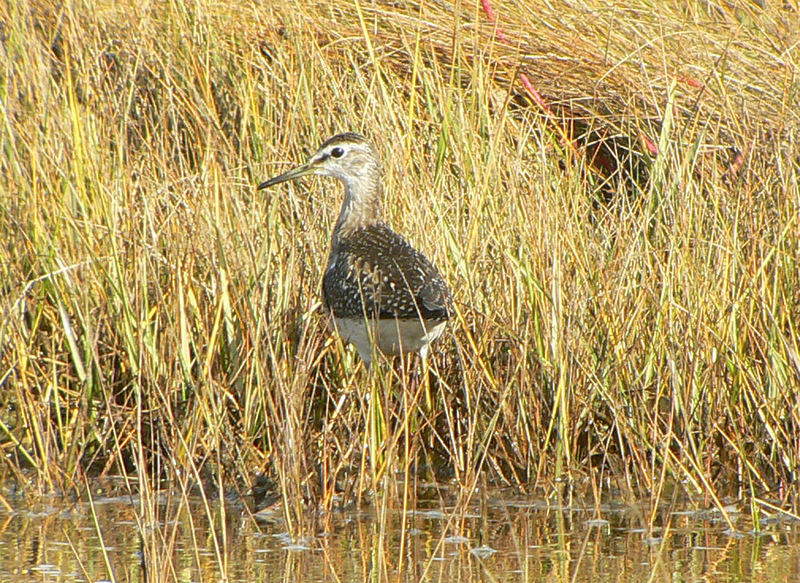 The autumn is still young - who knows what other great birds will be discovered in New England before the end of November?! with another lifer in the bag, Matan is keen to 'tick-and-run' while Susannah (top left) needs to study some more. 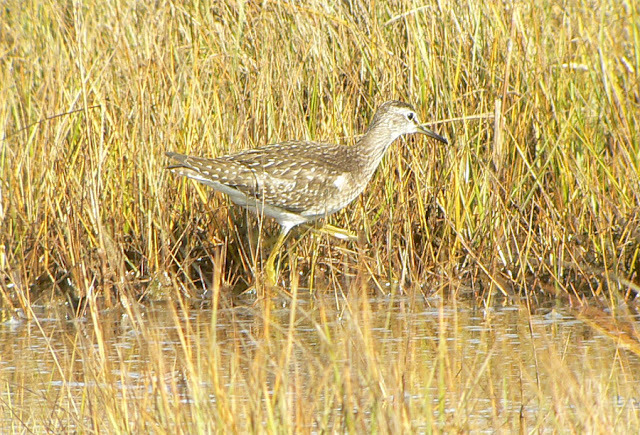 The loneliness of the long distance migrant - surprising to see the Wood Sandpiper feeding entirely on its own with no other shorebirds in sight. Aside from nine fly-over Killdeers we didn't see any other shorebirds during our one hour stay. 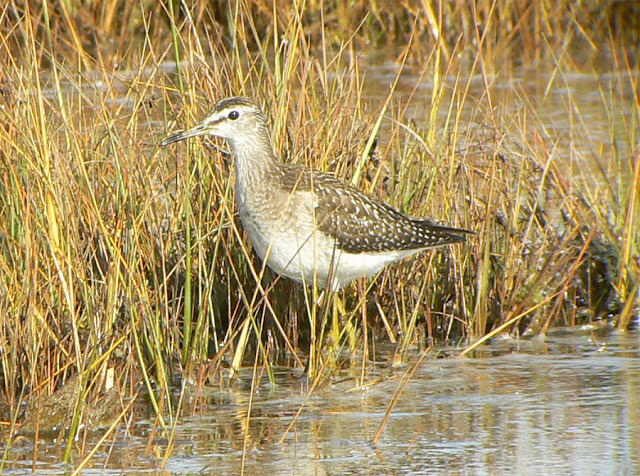 The favored feeding area of the Wood Sandpiper in the NW corner of Marsh Meadows. I think we were lucky in finding it straight away with other reports suggesting that the bird can roam throughout the marshes, disappearing for extended periods at times. Spruce Grouse - Moose Bog, North-east Kingdom, Vermont. October 12th, 2012. 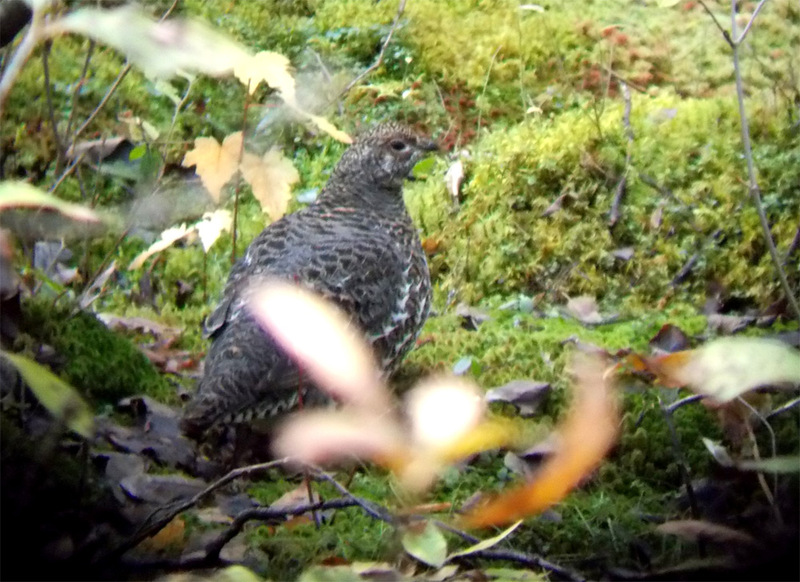 Our recent Birdfinders tour enjoyed close views of two Spruce Grouse foraging alongside the Moose Bog Trail. By no means easy to see, they blended in perfectly with their habitat. It was a superbly wild day with a cold front depositing squally showers of snow pellets around us for much of the day. 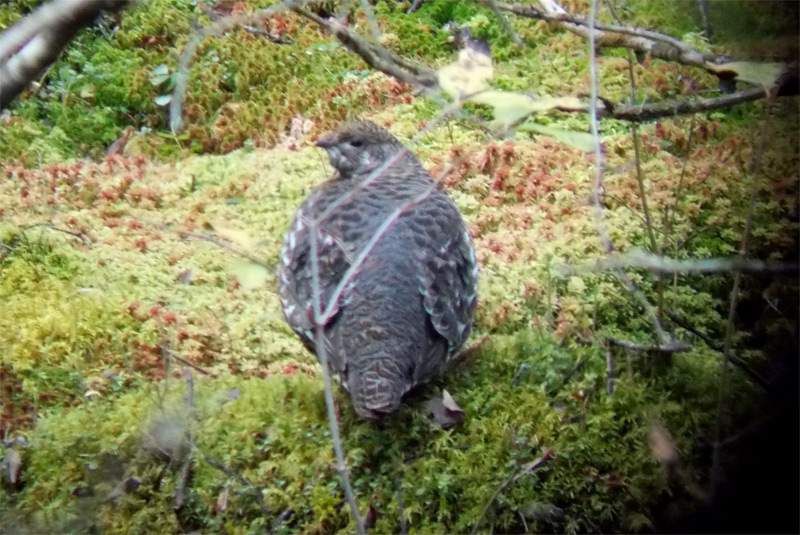 However, we found plenty of shelter in the spruce/fir woods. Late in the day, on the same trail, we came across a male Black-backed Woodpecker which called constantly from the top of a spruce for at least five minutes in what seemed like unusually bold behavior for a such an elusive species. All images are digi-bin shots using a Nikon Coolpix L26 through Leica Ultravid 8 x 42 bins. This Cackling Goose turned up as part of a mass arrival of Canada Geese on the Turner's Falls power canal late in the evening of October 10th. It was my first Cackler of the season in Franklin County, and a bird that delighted my Birdfinders group as well as myself. 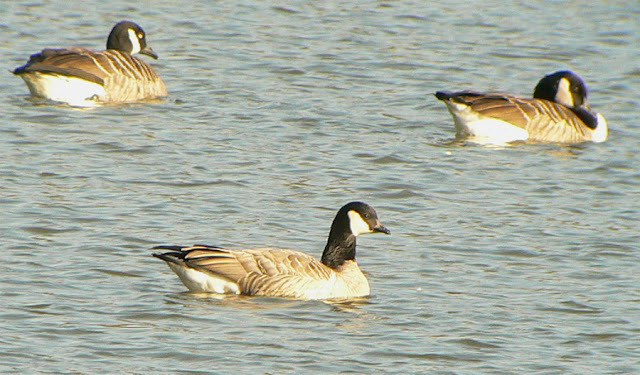 As with most Cackling Geese that I've seen in the Pioneer Valley, this bird closely resembled the nominate form B. h. hutchinsii. 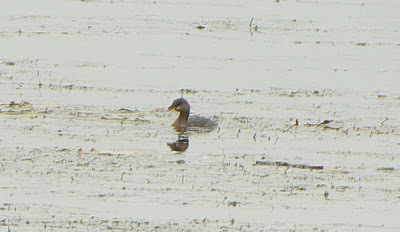 It was good to see reports of Cackling Geese coming from the power canal for at least three days after this sighting. Images taken at dusk using a Nikon Coolpix L26 and Swarovski HD spotting scope. 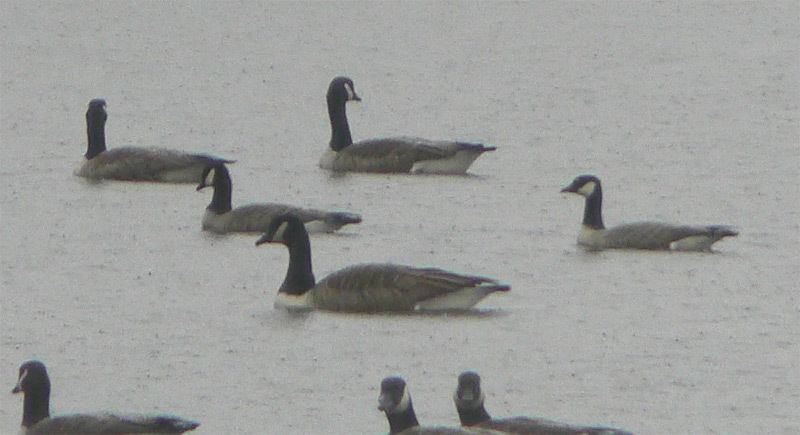 Cackling Goose (center) - with Canada Geese and Common Merganser (lower right), Turner's Falls power canal, Franklin Co., MA. October 10th, 2012. 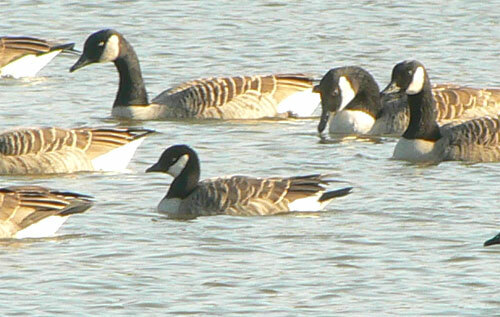 Cackling Goose (upper left) - with Canada Geese and Common Mergansers, Turner's Falls power canal, Franklin Co., MA. October 10th, 2012. Cackling Goose (center) - with Canada Geese, Turner's Falls power canal, Franklin Co., MA. October 10th, 2012. 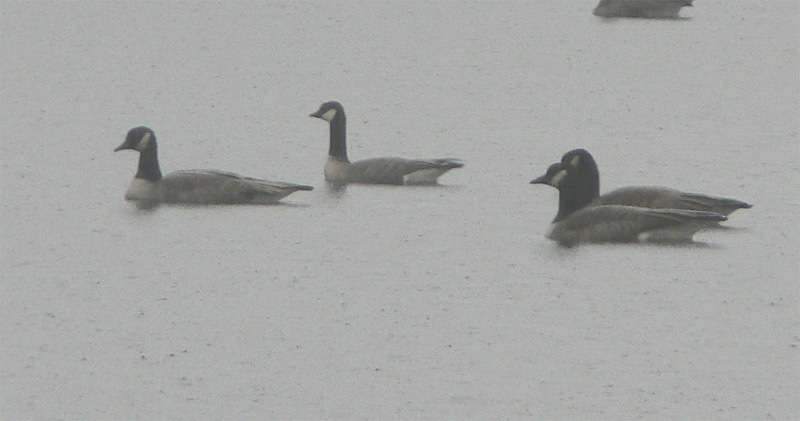 Cackling Goose (upper left) - with Canada Geese, Turner's Falls power canal, Franklin Co., MA. October 10th, 2012. 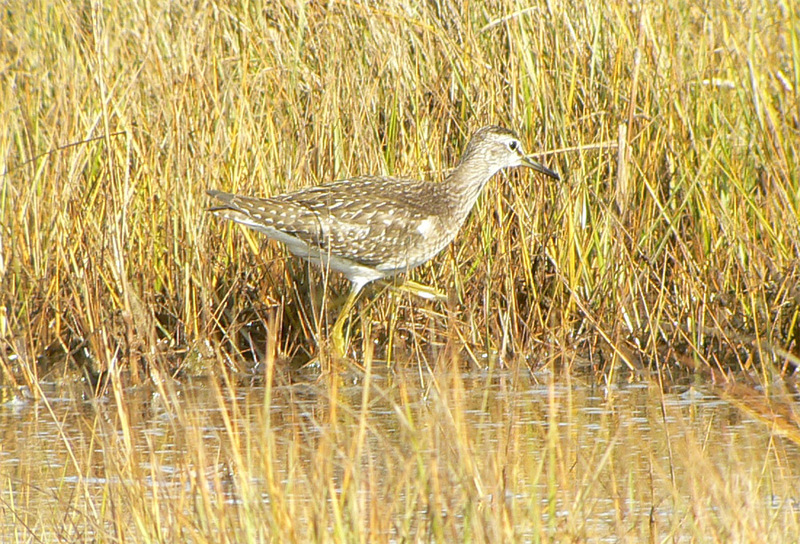 Quickly breezed by Barton Cove this morning with the thought that a few fresh birds may have dropped in. Good to see a White-winged Scoter and three Ruddy Ducks appear as the first ducks of note this fall, at least for my personal tally. Hopefully we can now look forward to more regular arrivals through the fall and into December. Apologies in advance for hideous glare on these images, one of the perils of viewing from Riverview Drive on a sunny morning in the fall! All images taken using Nikon Coolpix L26 through Swarovski HD scope. 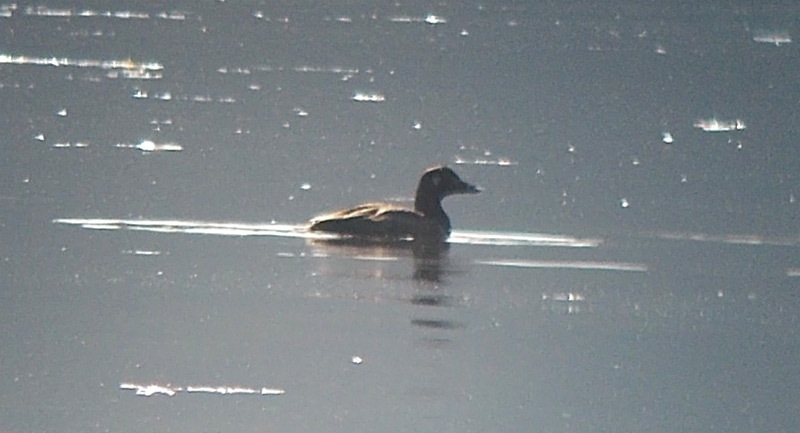 White-winged Scoter - female-type, Barton Cove, Gill, Franklin Co., MA. October 18th, 2012. 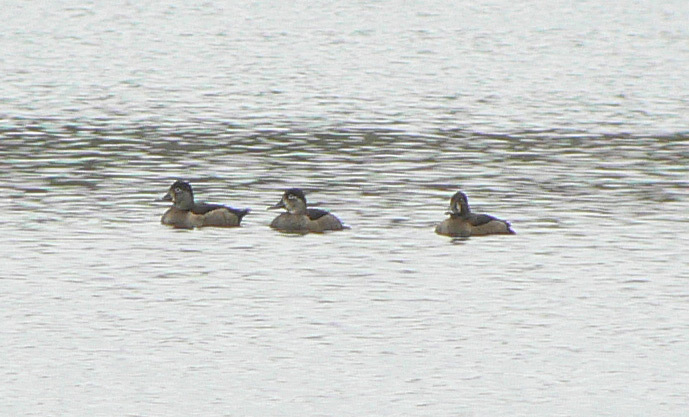 Ruddy Ducks - Barton Cove, Gill, Franklin Co., MA. October 18th, 2012. 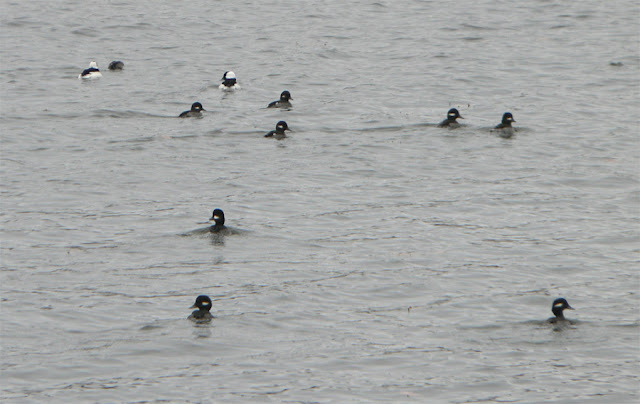 White-winged Scoter and Ruddy Ducks - Barton Cove, Gill, Franklin Co., MA. October 18th, 2012. 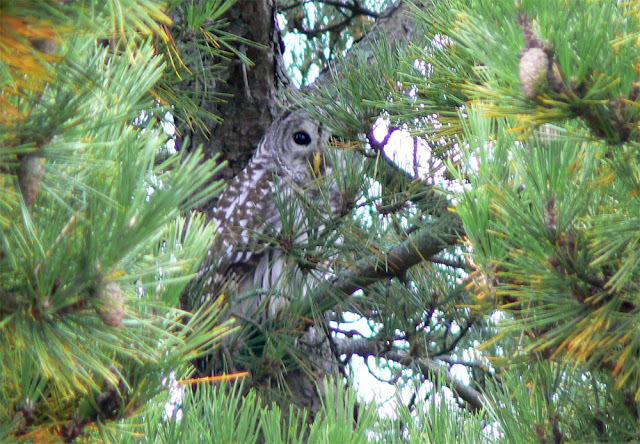 Barred Owl - Salisbury Beach State Reservation, Essex Co., MA. October 10th, 2012. 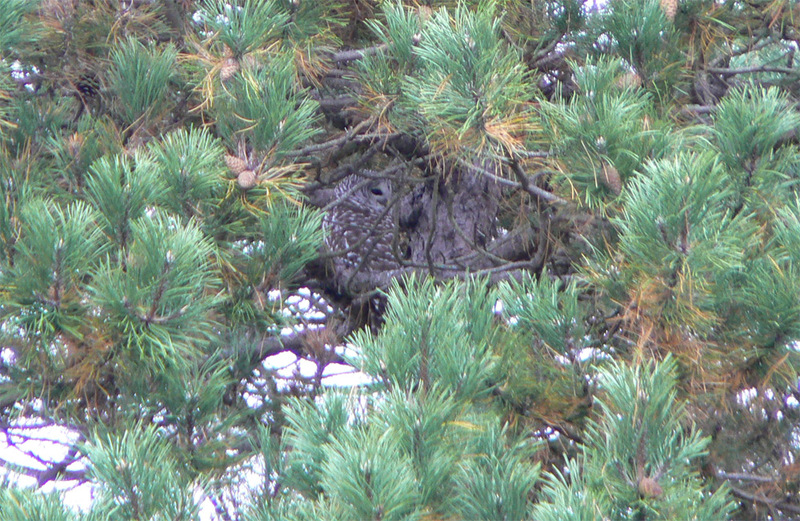 A nice find for our Birdfinders group as we searched the Salisbury Beach pines for owls. 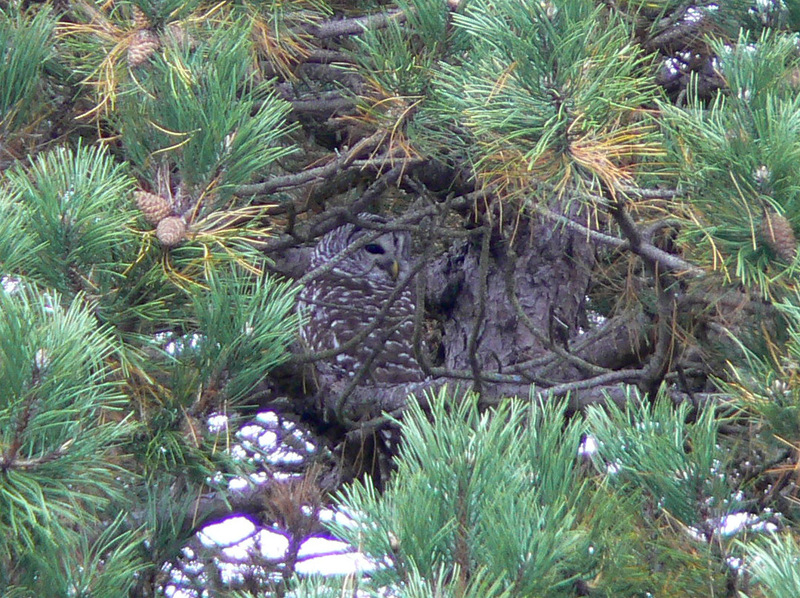 We were hoping for (perhaps) a saw-whet but came away feeling content with this rather skittish Barred Owl. Panasonic Limux FZ7.